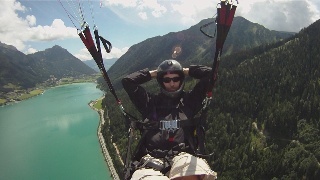 Filming a paraglider with the GoPro HD Hero ! – Neue Kunden gewinnen . . .
Für die Deutsche-Version des Artikels bitte hier anklicken. The Video was filmed with the GoPro HD HERO (see Link for more details). Most of the shots where made with a telescope-rod where the GoPro HD HERO was mounted. The GoPro HD Camcorder is then about 1 Meter away from the actor. While take-off the telescope-rod is mounted on the paragliding harness with two carabines and is unfasten during the flight. Then it can be filmed with one hand and the telescope-rod is of course mounted with a rope on the harness. To assemble the GoPro HD on the rod, you need the GoPro-Adapter for Bicycle (see Link for more Details). 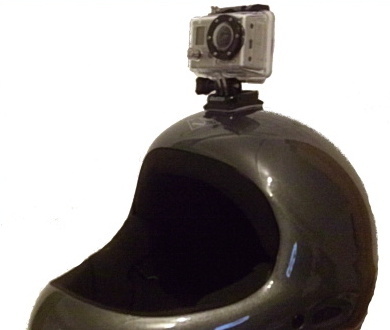 You can mount the GoPro HD HERO also on your helmet like you can see in the picture on the right side. If you don´t want to get blured shots – then you should hold your head still for a few seconds. The music is from http://www.istockphoto.com/audio and of course i bought the music – so that i will not get into a license conflict. Any Questions to this Video-Tutorial ? Then please write a comment. 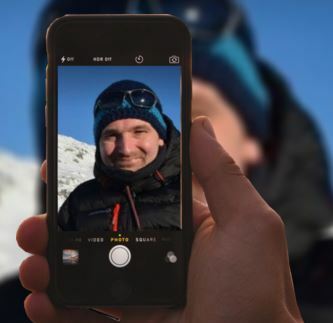 More about the GoPro HD HERO and more applications (Surfen, Biken, Motorsport etc.) , you can see in my other Article on this Blog (it´s in german-language) . 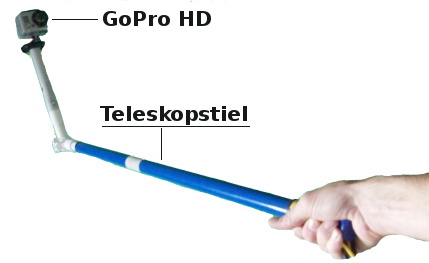 Helmkamera: Go Pro HD für Sport und Aktion ! 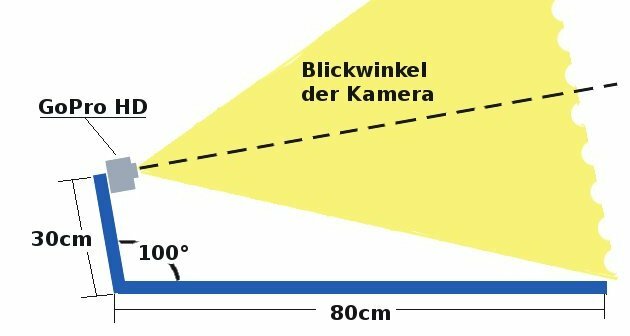 Genial, wie Du das gemacht hast – unterschiedliche Kamerapositionen, … und das während dem Fliegen!!! wie Siegmar schon sagt – richtig genial gemacht. Echt schön was man mit einer kleinen Helmkamera alles einfangen kann. Hast du gut gemacht mit den verschiedenen Einstellungen bzw. Perspektiven! Da bekommt man richtig Lust, selbst mal Gleitschirm zu fliegen! Excellent work. When will the English version be out? Wenn du ein gutes Schnittprogramm hast, kannst du den Fisheye-Effekt auch ein wenig entzerren – ich habe das allerdings nicht gemacht, sondern 1:1 übernommen. sehr schöne Bilder! Kannst Du mir sagen wo Du die Teleskopstange während der Start und Landephase verstaust? what make of telescope-rod do you use? Thanks for the video, this is a very easy and handful DIY. I have a question regarding your camera settings. You seem to get a very good and constant contrast on your video. For some reason, on mine, the contrast keeps changing and you either see the blue/white sky or the ground nice, but never quite booth like in your video. I did read the manual and tried both SPt and Cnt modes but none is satisfactory. Can you share your camera model and settings please ?